In the video Turn a Blind Eye, Lia Lapithi cynically draws a parallel between the expression “turn a blind eye” and the attitude of the tourist who, on holiday on a beach in the ghost town of Varosha, seems to make an abstraction of the violence of the décor. In fact, if most of the beach at Varosha is out of bounds, a few hundred yards of sand do remain accessible in front of the abandoned hotels, and, on the other side, a hotel is still in use. So many tourists come here to swim, while behind them rise up the buildings of tourist complexes deserted since 1974. Lia Lapithi has photographed Varosha from the end of the authorized part of the beach. By a montage of two viewpoints, she creates a panoramic image where, on the left, the banned part of the beach unfolds, and on the right the authorized, tourist part. Through a shift in the space of this image she has produced an animated sequence in which an ostrich is cut in. The incongruous creature strolls along, swaying from side to side, to the strains of cabaret music, before plunging its head into the sand. Lia Lapithi has turned one of the images from this video into a postcard, offered to the public. An ironical act, whereby the artist herself gives this town the status of a holiday spot. 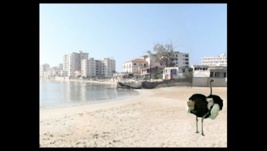 The postcard offers a sweeping view of Famagusta’s sunny coastline, showing the town and its buildings in the background. In the foreground and in the middle of the image stands the ostrich, head buried in the sand. The postcard offered to the public spreads information to do with the existence of Famagusta, and imitates a tourist report with pictures. The collage Defining Silence is a composite panorama of a photographic tracking shot which follows the outskirts of the cordoned off neighbourhood of Varosha, running along the barrier that it has been impossible to cross since 1974. Unable to enter it, the artist drives around this neighbourhood and makes a systematic topographical survey of it. Hidden in her car--because it is forbidden to take pictures of the zone--she took more than 600 photographs to put together this fresco and thus developed a systematic work recording the Cypriot split. This panorama follows a succession of barbed wire, wooden barriers, and barricades made of jerry cans which separate the town and give glimpses, beyond it, of abandoned constructions and gardens. The last photograph depicts a panel on which is written, with translations in Turkish, English and German: “Controlled Road. Taking photographs forbidden. Do not leave the road”. The perimeter of Varosha measures about eight kilometres, or five miles. Its representation is unfurled over 34 metres/110 feet in the Maison de la Culture in Amiens. 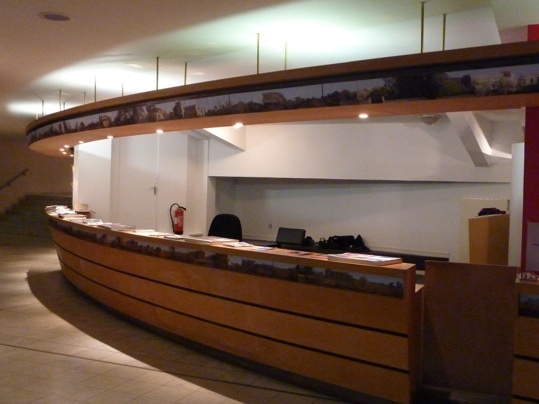 The first part of the panorama is affixed above the reception desk, following the curved form, and extends from left to right in such a way that the visitor has to walk along to encompass its entire length and experience the time-frame. It then continues below this same desk, again running from left to right.